Vanity Trumps Utility In The Den Of Iniquity. When your clothes are made of cassava leaves, you don’t take a goat as a friend. We all seem to think for ourselves and our assumed enclaves only, rather than for our country. We seem to have become the land of the timid and the Hollow Balls? It appears that the sense of siege which many of us have developed to national issues, courtesy of our low level development, seems to colour our reaction, even the otherwise intelligent people. But, objectivity requires that we discuss issues on their own merits, not tether them to partisan and/or contemporary norms. A corrupt sys­tem with incapa­ble personnel cannot and will never produce a value driven society. If we look at the path we have taken and manage to defy our natural indifference to serious issues, one thing we are sure to discover, and which would aid the proper develop­ment of our nation would be the absence of truth and the increasing presence of absolute selfishness and lack of a nationalistic fervour to drive the kind of vision that is needed to make the nation great. However, we cannot continue to subject our national interest and existence to the whims of our leaders. Which is why, I have always tried to emphasise that the lack of understanding of the political elite has deterred the progress of the nation and that this is why the largest members of the populace are wallowing in poverty in spite of the abundance of wealth which God has endowed us with in this country. For example, and from all indications and against national and international outcry and advice; as well as amidst excruciating economic downturn, it is becoming clearer by the day that President Koroma’s Teflon government is determined to damn the consequences, overlook our major problems and dream of its name in neon signs in what is obviously the hand of Esau and the voice of Jacob. With water of life not available to the people; with our health services and hospitals just mere glorified consulting clinics; with majority of the people living in shanties; with our roads and settlements becoming refuse dumps at the slightest of rains; with the cost of living forcing people to eat malnourished food or go without; with our youths roaming the streets and forced to undignified existence; with our schools and higher institutions, where the future lies, churning out educated illiterates because of lack of materials and resources; while our humanity has known extreme poverty and hunger which are some of the addictive drugs fuelling crimes, conflicts and violence, the peacock men in government say the lure of Yuan and dollars from the crooked hands of the Chinese and for a vanity project for that matter, is more alluring than whatever we think. Well the ‘gods’ are not to blame, since we have become genetically mediocre as a society. Big shame. The problem is, most of us cannot envision a future that is not directly projected (linearly) from the past; especially in the peacocks’ garden/enclosure called Sierra Leone’s leadership. And some call me a theoretician for daring to dream in full technicolour. My people have withered. The curse of the easy money is looking eternal. But must we all hands akimbo and allow foreigners to eat all our lunch? It is presumptuous of the President and his lieutenants to assume that they know what is best for Sierra Leone better than the collective wisdom of those who have been bearing the brunt of some of their irrational decisions for so long. It is clear that the thoughts and scheming of our leaders who are jumping over any lolly from foreign hands, like ants over sugar, are not with the objective of wiping off the tears of the masses; but simply to secure private political and economic benefits while claiming to champion national interests which obviously does not include the immediate eradication of poverty and hunger. It is really scary, especially because those in power are taking the masses for granted. Continuing economic collapse points to social upheaval on a big level. Little bubbles can easily become boiling water. They do not seem to recognise the gravity of where we are now and how it can snowball into a real calamity. The Chinese may try and convince us that we have nothing to lose and that Mamamah is their own panacea to all our woes, which our leaders seem to believe in; but that doesn’t make their opinions cast in stone. The statistics being presented to us, is nonsense economics, which no matter how good it is, does not put food on the table of the people. It is data that’s disconnected from its contextual reality and which is not worth analysing. Garbage in garbage out. Ungodliness, selfishness, greed, lack of consideration for the plight of the masses, unpatriotic behaviour or lack of commitment to the nation, political arrogance and intolerance are some of the causes of our woes in this country and in this scenario we are seeing them at its best. Hustling power has been key for so long and there, lies the moral dilemma of the Koroma administration so far. Truth is, if President Koroma goes ahead with that vanity project then the truth is not in him and he does not love Sierra Leone as he often claims. If he is looking for a lasting legacy, then there is nothing better than the provisions of the basic necessities of life for the generality of the people and at best, the construction of the bridge to Lungi which will be everlasting. Does it mean that because the Lungi Bridge has been a problem that we have never been able to solve for five and a half decades, we can never solve it? Is that why ideas for bridging the gap in our underdevelopment are being challenged and demotivated by government machinery before they see the light of day. Of course, this proves my point about our national psyche? It also symbolises everything wrong with our nation which consumes everything from China especially, and produce nothing. Obviously, such an economic model that is dependent on others is simply not sustainable; which is why I find it gut-wrenching that as a people led by an inglorious leadership, we have no qualms with the consumption of luxury items, foreign goods and personnel as well as ideas. 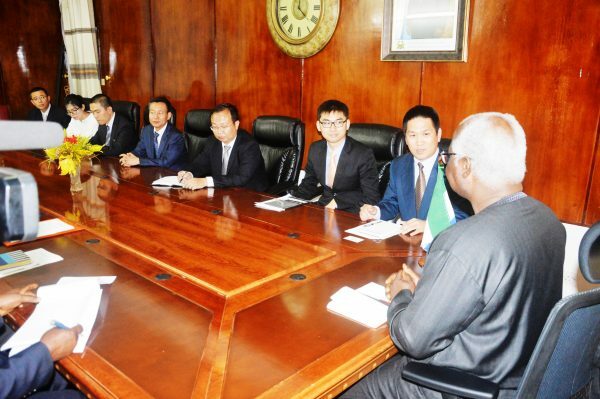 The Chinese delegation that saw President Koroma recently, did not even hide their mission. Read this and watch the underlined words: “Head of delegation and Director in Charge of Assistance for West African Countries, Mr. Suo Debo said they were in the country to negotiate with the government of Sierra Leone on the Mamamah International Airport as it is an important project to both China and Sierra Leone. Pressure, arm twisting, carrots and sticks, back-hander; name it. It is all loaded into that simple statement which shows that the Chinese are more interested in the project than we are. And the government is wondering why majority of the citizens have lost sight of how to make sense out of this nonsense of an airport, amidst their current plight. This same China that is forcing us to commit to a debt burden that future generations of Sierra Leoneans will be saddled with, is the same country which in the past, when it was no better than what we are now, decided that to be able to cater for themselves, they needed to take hard decisions, including a One-Child Policy which has now been relaxed. Their strategy of development was to be self-reliant, eat what they produce, be visionary, programmatic and pragmatic, while holding on to their culture, language, ideas and ideals. After internal development, they blossomed and stepped out into the centre stage of globalisation outpacing almost all other countries. A house without good foundation cannot stand. Building up the power base is the ultimate infrastructure. Without power, we are just playing Russian roulette. With all the ‘robust’ economic policies of the past, where are we today, zero level. Rebuilding our knowledgebase will require a lot more than foreign money and fanciful airport. Fact is, free finance and vanity projects are often a crutch against optimised thinking. Not believing in our own capacity is the ultimate national inferiority complex. Everyone knows that a good scam usually begins with the data and I refuse to be mugged in the name of belonging. Once you can see a bandwagon, it is already too late to join it. The government cannot justify investing in what conflicts with the gut feelings of the generality of the people and which is essentially our reality. Development is not about buying the latest gadgets and tools or planting the most sophisticated building. If those who lead us will not align with our desires, then we need to clear any cobwebs in their heads, put on our thinking caps and plot the way forward. What is clear in my mind is that we must put an end to impunity whether by marauders or thieving politicians. When I read metrics on Sierra Leone’s macroeconomics I find it difficult to square them against the long term stagnation and continued degradation of the quality of life. We don’t even have a meritocratic system in place for harnessing, promoting and motivating our best people and our best endeavours because leadership has been a con game in this land since independence to be honest. We also need to look at the human element…to be honest, all these supposedly brilliant proposals…in the Sierra Leonean context; if some people “up there” are not making big money from some of these proposals, they would not likely and ordinarily see the light of day. Our problem is nothing but US. We have become uneducated, insecure, and suffering from the level of inferiority complex that can only have come from a systematic mental and psychological degradation over a long period of time. We are more than we can imagine, much greater than where we are but we just don’t get it. I have listened to unvarnished truth about us, coming from the white man that we shrivel at, on mere sight. So we cannot really blame those exploiting us even if some of them are capable of the occasional moral introspection. So why not we – the shallow, the insecure and the world’s leading mediocre, in our grossly hypocritical spirit and in the pointless material that our leadership so insanely crave, see this truth. Here we are dancing on the edge of the cliff; with violence wrecking parts of the country and criminality taking firm roots. There is need for a rethink. It is not a matter of who is to blame, but how we can pull together for a better life. We need to build or reinforce non-partisan ideologies. We can’t go on this way. Pretending that we are what we are not, is delusional. I am not saying it is not good to dream but we have operated a fake economy driven by fake and fraudulent buoyancy, which was unsustainable. The reset button should now be put on. On the streets, an indignant populace are not in absolute rage simply because of a sense of paralysis. They not only feel poorer than eight years ago, they are actually poorer. Jobs? Where are they? Light? It’s suffering from epilepsy. Health? Just ask for the number of needless deaths and you’ll get a clearer picture outside Ebola’s unveiling of the mask. Neither do I think our drawback is about funding at all. It’s more about the laziness in actualising the Change agenda through policy thrusts (ideas) that are geared towards the people’s yearnings and capable of boosting/energizing the citizenry simultaneously. Leadership and ministership is not a position but a critical functional cog in the wheel of change. That’s the difference between now and our past. The theatrical performance of the past decade is an example of how our political elite complicate matters or sow discord rather than proffer lasting solutions to our dysfunctional society which has completely wiped out the middle class that used to be the defenders of the norms and sound traditions which sustain a people. Today, with the poor too concerned and overwhelmed with cares of everyday survival, the mesmerising but dysfunctional power-hungry political class which also ensured that the civil service, the intelligentsia and the other realms of the estate are comatose, is having a field day. Unfortunately we should expect more. It’s what you get when emotions and sentiments have replaced truth, logic and objectivity in a society. I repeat, a society that places loyalty over objectivity is one marinating in mediocrity. Unless arrested and reversed, its demise is only a matter of time and available resources. The need to conform and the instinctive resentment and attack on the non-conformist is what keeps us going in lack. But for how long? It is a pain watching the highly nourishing soil of my youth turn into a highly toxic swamp sludge. The people do not want solution. They want consensus. Big difference. The truth is the truth even if no one votes for it. And a yarn is a yarn even if everyone votes for it. At some point, we will be compelled to face the stand alone truth – the only “true kind’ of truth. Tick tock. . . . Disheartening is our STP – standard temperature and pressure. Cry my beloved country.